What is a successful social media campaign and how do you ensure that the money spend on social media generate a high return on investment (ROI). 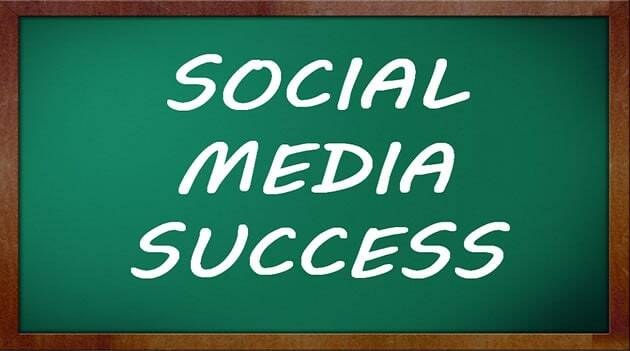 What is a successful social media campaign? When you run campaigns on social media the first thing you should do, even before setting up the campaigns, is to set your targets and conditions. By targets and conditions I mean to identify what you want to achieve from your campaigns (goals), how to measure the ROI and what you consider to be a successful campaign or not. Your goals depend on your business and marketing objectives (increase brand awareness, make more sales, increase customer royalty etc.) but in general they should fall into one of the above categories. Despite of what you want to achieve from social media, there are some guidelines or tips you can follow to increase your chances of running a successful social media campaign. Before you start with your main campaign, it is better to fist run a pilot campaign for a couple of days or a week to test different ads, targeting options and messages so that when you run the main campaign it is more optimized. For example, if you plan on running a campaign on Facebook for a month, you can first run a pilot campaign for a week testing 2-3 images for the ads and different targeting options and at the end of the week you start your main campaign with the winners (ads with the best CTR). Social media networks have a lot of information about users and that includes demographics, interests, likes and dislikes and many more. When running campaigns on social media take advantage of all these data and make your campaigns targeted to specific groups of people (based on either demographics or interests) and you will get better results, lower cost and a higher ROI. When running a campaign on Facebook or Twitter it’s easy to get carried out and forget about the ‘call to action’. In simple terms, this is the part where you will ask users to do something i.e. visit your website, register to your newsletter, view your products or services. In each and every ad or promoted post (or tweet) make sure that there is a clear indication of what users should do when they see your ads. 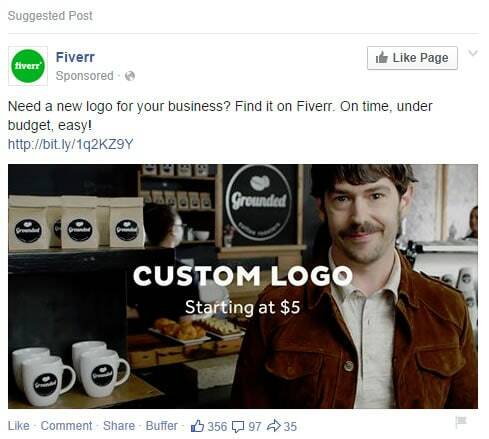 Here is a very nice example from Fiverr on Facebook. It may sound obvious but this is probably the number one mistake that people make when they setup social media campaigns. It is true that that all networks will give you statistics about your campaign (numbers of views, clicks on your ad, costs etc.) but you also need to setup your Google analytic goals and conversion tracking to know which of the users performed an action that is important to you. The statistics are fine but you need more data to determine if the campaign was a success or a failure. For example, when you run a Facebook campaign with the intention of getting conversions you need to setup Facebook conversion tracking so as to know which visits from Facebook generated a conversion and also calculate the conversion cost. As I mentioned in my digital marketing tips article, social networks are for people and not for businesses. This means that if you try and push it too hard by over promoting your business without giving incentives or benefits to the social media user, you will fail. It’s better to always keep in mind that users don’t want to see your ads and try to find ways and incentives to make them engage with your message. One of the best ways to do this is though discounts or special offers. See for example how Amazon is asking users to comment with their hashtag in order to enter their contest. Social media is an effective way to get more customers and make more sales but this is not always the case for all businesses in all niches. There are cases where social media is not the right medium to reach new customers and it may be better to stop your campaigns instead of throwing your money without a return. Let’s say that you are running a campaign for 3 weeks and already reached thousands of people with a good CTR but you have not made any sales. What do you do? Keep running the campaign and spend more money or stop it? There is no simple answer but the best approach is to examine if there is a way to optimize the campaign further either by changing your targeting options or optimizing your landing page. If you think that both of these are already optimized then maybe the best approach is to stop the campaign and allocate your budget on other tools (PPC campaigns, SEO etc). To minimize the chances of having to declare your campaign as a failure, you can do more careful pilot campaigns (as explained in Tip 1 above) at the beginning and before spending too much money. It happens that some people may not be happy from seeing your ads and they don’t like the idea that you are trying to sell them something so they sometimes enter bad comments or share something not good about your company or products. It’s important that during the time you run your campaigns you also monitor your brand mentions (the simplest way is to search for your brand name on Facebook, Twitter, Pinterest etc.) and see what people are saying about it. You can then try to reverse any bad comments or critiques by providing honest answers or solutions to their comments or questions. What else is missing from my list of social media campaigns tips? Thank You Alex Chris For Sharing This One.. it’s helpful For me. Thanks for your comment. Glad you found my social media post useful. Nice tips. thanks Alex Chris. Thanks thuthuatvip for your comment. Thanks for this awesomely informative detailed post about social media campaign. I was eager to know this information. Thanks for sharing. Nice to ‘see you’ again. Happy you find the post useful. Thanks a lot Donna. Its always useful to go back to the basics and refresh your memory. Irrespective of your follower count, post constantly. This gets your brand to be seen regularly by your followers. This will give them a chance to become more regular customers this way too. You might be required to post 2-3 times a day, or 2-3 times a week. Monitor your account carefully to determine your post frequency. Most Brands don’t have proper knowledge about the best time to post on . use analytic tools to observe when your photos are getting liked and commented on. Find out at what time’s your hashtags are being used. Then make sure to post your fresh content at the most active times. And also remember to not over post. It is not essential for you to post on Instagram every day. If you start posting a lot of content daily on a continuous basis, you might over-saturate your followers’ feeds and then your posts go from pleasant to irritating, and they lose interest on your page. I had few of those details in mind but with the spreading out, I got it all clear now. I agree with you 100%. Contests is a great way to encourage interaction on your social media campaigns. Yes, you sometimes don’t need a lot of money but creativity! Thanks for sharing your tips with us. You’ve got great tips for a social media campaign. I love how you said that it’s important to pick and audience and a demographic and cater to them. That’s just like personal social media too because people always cater their posts to their friends!